The original Crisp Crust Party Pizza™.Stackable packaging for maximum freezer space.Your favorite classic, affordable, 'to share or not to share?' frozen pizza! : Totino’s Pizza is the perfect shape for toaster oven preparation.Fit two Totino’s pizzas on a baking sheet! The original Crisp Crust Party Pizza™. Stackable packaging for maximum freezer space. Your favorite classic, affordable, 'to share or not to share?' frozen pizza! 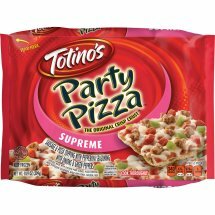 : Totino’s Pizza is the perfect shape for toaster oven preparation. Fit two Totino’s pizzas on a baking sheet!